Albuquerque, NM – At a news conference held today, Governor Susana Martinez proclaimed March 31 – April 6, 2013 as Wildfire Awareness Week in New Mexico and called upon residents and visitors to the state to continue doing their part to prevent human caused wildfires. In 2012, New Mexico experienced its largest wildfire in recorded history, the Whitewater Baldy Complex, and the state’s most destructive fire, the Little Bear, which burned more than 250 structures near Ruidoso. For this reason, local, state, federal and tribal interagency partners continue to stress wildfire preparedness and prevention. At today’s news conference, held at Rio Grande Nature Center State Park, Governor Martinez announced a new pilot program that will hire and train 40 United States military veterans as wildland firefighters. These veterans will be placed on four fire crews that will be available for assignment on wildfires statewide. The new program is a collaborative effort between New Mexico State Forestry, the Department of Veteran’s Services, the Department of Corrections and the New Mexico Workforce Connection. Today, local, state, federal and tribal agency representatives discussed preparations for the upcoming fire season and how residents can best prevent human caused wildfires and how we must all be prepared. Since the 2012 fire season, interagency partners have worked to train hundreds of firefighters in wildland fire skills, identify grant funding for equipment and teach landowners how to reduce their wildfire threat through land treatment. 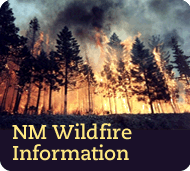 Since January 1, 2013, New Mexico has experienced 59 wildfires on state and privately owned land that have burned approximately 739 acres. Last year at this time, 68 fires burned approximately 2,104 acres. · Prune trees near structures and remove excess ground fuels such as fallen needles, cones and branches. · Keep in mind that the use of fireworks is always prohibited on all public lands including state parks or national forests. For more information on wildfire prevention, how to create defensible space to protect lives and property, log onto: www.nmfireinfo.com or www.firewise.org. For more information on preparing your homes and families, visit the New Mexico Department of Homeland Security & Emergency Management’s Family Preparedness Guide: http://goo.gl/Zuams.